President Donald Trump issued a bizarre statement Tuesday explaining why he would take no action against Saudi Crown Prince Mohammed bin Salman even though the de facto Saudi leader may well have had the journalist Jamal Khashoggi brutally murdered. Trump’s statement was full of falsehoods and makes for a frightening read, but it reveals a dark secret about US foreign policy: It needs Saudi Arabia and has always turned a blind eye. Accepting the killing of Khashoggi is horrific, but the US can’t really pursue regime change in Saudi Arabia without opening itself up to extreme danger. That’s how President Donald Trump opened up a particularly bizarre statement Tuesday in which he explained that the US would stand by its ally Saudi Arabia even though the kingdom’s crown prince and de facto ruler, Mohammed bin Salman, may have had the journalist Jamal Khashoggi brutally murdered in Istanbul. The statement met near-universal disgust, but it reveals a dark truth of US foreign policy: It abides human-rights horrors from Saudi Arabia because, for seven decades, US presidents have decided they have to. While Trump’s exclamation-point-filled statement was anything but normal, the US ignoring Saudi human-rights atrocities is the norm in this relationship. On August 9, for example, Saudi Arabia dropped a US-made bomb on a school bus in Yemen and killed 40 children, and the US and Europe continued with arms sales to the kingdom. 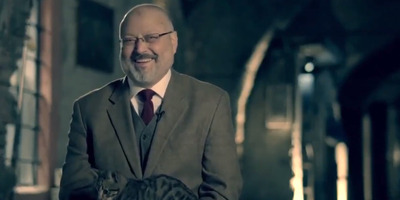 MOHAMMED AL-SHAIKH/AFP/Getty ImagesJamal Khashoggi pictured in 2014. “It could very well be that the Crown Prince had knowledge of this tragic event – maybe he did and maybe he didn’t!” Trump’s statement said. “That being said, we may never know all of the facts surrounding the murder of Mr. Jamal Khashoggi,” it continued. Both of these statements play coy with a mountain of evidence that the Saudi royals, and not rogue agents in their inner circle yet beyond their control, ordered the killing and dismemberment of a journalist living in the US. That said, they’re both most likely true. No US inspector ever entered the Saudi Consulate in Istanbul where the October 2 killing took place. It was two weeks before any outside inspector stepped foot in that consulate. In fact, almost all of what the public knows about Khashoggi’s killing has been leaked to the Turkish media from anonymous Turkish intelligence sources. Turkey under President Recep Tayyip Erdogan has purged its press, military, and spy services to the point where none are independent. “Members of the Turkish political establishment are looking to use this crisis for the benefit of Turkey,” Sanam Vakil, a senior consulting research fellow in the Middle East North Africa Programme, told Business Insider. For over a month now, a steady drip of leaks has provided ever more grisly details about the killing, keeping the story in the news and keeping the pressure on leaders day after day. But if Turkey is so sure that Crown Prince Mohammed had Khashoggi killed in Istanbul, then why hasn’t it moved against him either? Erdogan has described Khashoggi’s death as a murder ordered by the “highest levels” of Saudi leadership, but he’s made no formal charges over the killing even though it took place in his country. No European leader has blamed Crown Prince Mohammed, either. Germany barred some of the men charged by Saudi Arabia, widely seen as accomplices or scapegoats, and cut arms sales to the kingdom. The US did pretty much the same with sanctions and scaling back its military support for the war in Yemen. “I don’t think that Washington or Paris or London are looking necessarily to sanction MBS personally” but rather wish for more accountability from the kingdom, Vakil said, referring to the crown prince by his initials. But for all the outrage over Trump’s indelicate statement, what’s the alternative? What does putting “America First” in regard to Saudi policy look like? Essentially, it comes down to keeping a US-friendly regime in place in Riyadh. The US has no alternative to the crown prince, Tony Badran, a research fellow at the Foundation for Defence of Democracies, told Business Insider. If Trump called on Crown Prince Mohammed to step down, essentially regime change in Saudi Arabia, it could end horrifically for the US. For years, Al Qaeda has argued that “the Saudi regime stands only as a tool of the Americans and that if you destabilize the relationship then the Saudi relationship falls and [Al Qaeda] will inherit the place,” Badran said. The world’s 1.6 billion Muslims are all required by their faith to visit the Saudi city of Mecca in their lifetime. If Saudi Arabia, the custodian of the holy cities of Mecca and Medina, came under the power of an openly anti-US regime, it could cause incalculable damage to the US. The reasons Trump brings up for his continued support of Saudi Arabia don’t make a strong case. He lists Saudi’s job creation in greatly exaggerated terms. Trump says Russia and China would swoop in with arms sales if the US withdraws, but Russia and China don’t make Patriot missiles or bombs that fit on US-made F-15 fighter jets. Also, the idea that Saudi Arabia badly wants to provide humanitarian assistance to the same people it blockaded in Yemen amid one of the worst cholera and famine outbreaks in modern history is dubious. Screenshot/Twitter/Hatice CengizThe fiancée of Khashoggi posted a touching tribute for him on Twitter. Much of the US press has fumed over Trump’s handling of Khashoggi’s death, given his role as a journalist writing columns for The Washington Post. But Khashoggi, who died at 59, spent 57 years in Saudi Arabia, spending much of that time working as an operative for the kingdom in its pre-reform days. He worked closely with Osama bin Laden in the 1990s before cutting ties after September 11, 2001. After that he worked closely with Saudi intelligence as an operative. At The Post, he advocated changes in Saudi’s government once Crown Prince Mohammed took power and started on his attempts to overhaul the Saudi economy and introduce some social reform. In his last column for The Post, Khashoggi said the Arab world most needed a free press. Ironically, Khashoggi’s death turned much of the US media into an outlet for foreign intelligence services and state narratives aimed at harming the US-Saudi alliance, which may not be in the best interest of the US public. Trump’s businesses have made millions from the Saudi government, and the crown prince gave his New York City hotel a huge boost.